Ever since it burst onto the scene in 2008 as the first ‘full-sized’ 125, Yamaha’s YZF-R125 has been a firm favourite with racing-obsessed teenagers. A hugely popular model, it equates to 36% of all R-Series sales and over the years Yamaha has played upon its sporting heritage by making it look sharper, handle better and stop with even more ferocity. Variable valve timing on a 125! 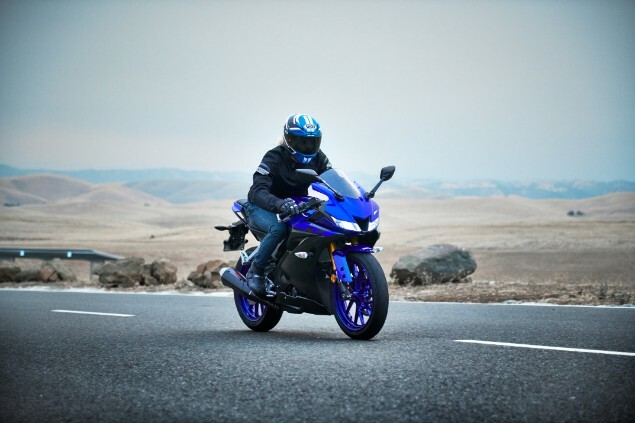 As part of a major overhaul for 2019, Yamaha has done something very surprising with the new YZF-R125 and incorporated variable valve technology within its 125cc single cylinder motor. Why has Yamaha done such a thing? If you are restricted on peak power as all A1-legal bikes are, there is only one place to turn to – low and mid-range torque. Which is exactly what the VVA (Variable Valve Actuation) system delivers. A very clever system, VVA effectively allows Yamaha to run two profiles of intake cam. At low revs the four-stroke single’s solitary overhead cam operates a rocker arm to open the two intake valves while another rocker arm controls the exhaust valves, which is a fairly conventional set-up. However in Yamaha’s VVA head, a secondary smaller rocker arm sits alongside the primary intake one and this rocker arm has a higher-lift profile. At 7400rpm a servo is activated, which fires a pin through the two rocker arms, allowing the secondary arm to take over control of when the valves open and shut, altering their timing. Why does this matter? 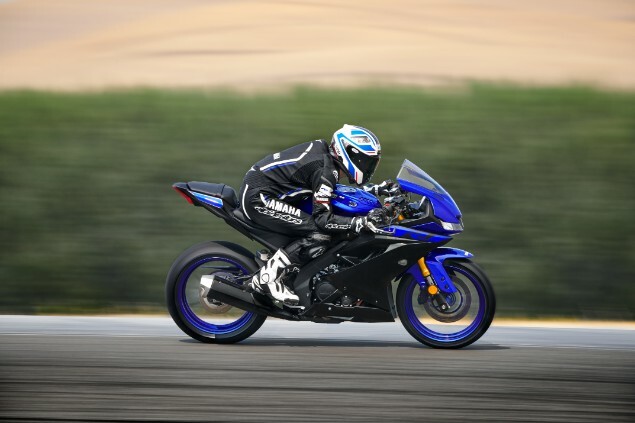 A low-lift cam profile, which is what the YZF-R125 has at low revs when VVA isn’t activated, is good for torque and fuel efficiency while a high-lift profile (once the secondary rocker arm takes over) is better for top end performance. In short, VVA gives the YZF-R125 the best of both worlds – low and mid-range torque with an A1-meeting 14.5bhp top end. But can you really spot the performance gain on a 125 with just shy of 15bhp and 9.2lb.ft of torque? 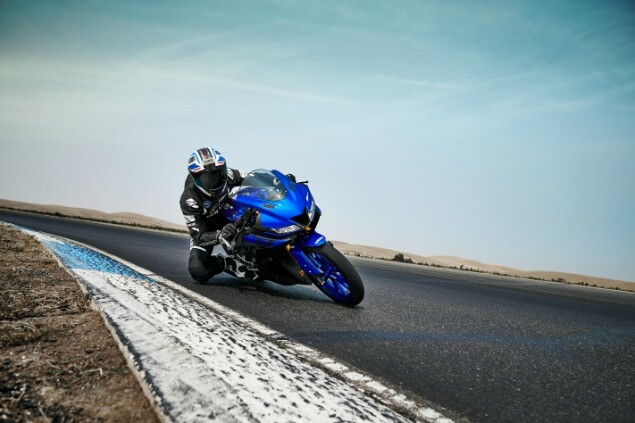 Surprisingly you can, but that’s only half the story of the new YZF-R125. What else is new on the YZF-R125? Alongside the VVA system, Yamaha has gone to town on this third generation of YZF-R125. The steel Deltabox chassis has been revised alongside the aluminium swingarm for improved agility, the rear wheel is now a beefy 140-section unit with Michelin Pilot Street tyres front and rear and the KYB suspension has been optimised with a lovely YZR-M1-style top yoke added for a bit of visual bling. While the single four-piston radial caliper is the same as before, the ABS and brake pad compound has been tweaked and there is even a cool MotoGP-type brake lever protector as standard fitment. And the race track inspiration doesn’t stop there with the YZF-R125 now carrying an R-Series style fairing, complete with LED lights and a huge gulping frontal air scoop that looks just like the one on the firm’s YZR-M1 MotoGP bike! In short, it looks just how a young rider would wish and should be enough to keep teenager riders happy. What’s the YZFIR125 like to ride? The great thing about the YZF-R125 is that it rides as good as it looks. In the city you can definitely spot the boost in low-end torque the VVA system delivers. It’s not night and day when compared to the old model as we are talking fairly small gains here, but it does mean fewer gear changes as the motor is less inclined to bog down and also the R125 is a bit more sprightly away from the lights. This feeling could be in part due to the altered final drive ratios, which have been lowered on the new model for better acceleration, but there is certainly a new freshness to the four-stroke motor that wasn’t there before. On congested city streets there is little to find fault with and the R125 has a wonderfully light clutch action, slick gearbox and the kind of agility that sees you nipping through the smallest of gaps. But it is out on the open road that this mini-R-Series bike really comes alive. As well as looking all sporty the R125 delivers in terms of handling. The combination of the Deltabox chassis and wide, sticky tyres mean you can ride hard, keeping the throttle pinned at all times and even pushing to kneedown angles if you are so inclined. We took the R125 around a fairly tight and twisty track and it was great fun with the suspension and brakes proving more than up to the job in hand. However as fun as nailing the R125 around a track was, Yamaha have remained true to the R125’s main selling point – its versatility. Yes, the YZF-R125 looks amazing, but it is also a very practical bike for the teenage market. It is cheap to run with the motor able to deliver a claimed 132mpg while the riding position remains wonderfully ‘big-bike’ and able to accommodate even the tallest of riders. 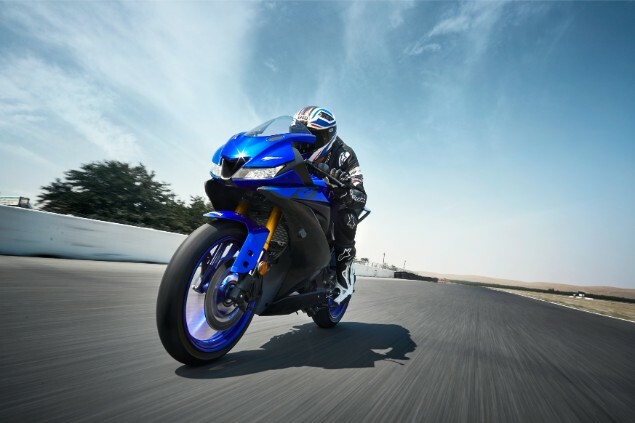 Shorter riders won’t be intimidated by the YZF-R125 as it has a sensible 820mm seat height and weighs just 142kg. And best of all, despite its huge number of updates, the YZF-R125 costs the same £4499 as the outgoing model, which is tremendous value for money. It may lack the full-colour dash with connectivity that some rivals boast, but that’s about the only part Yamaha have skimped on when it comes to this excellent mini race replica.